Monday, Sept. 3, 2018 – YIPPEE! Hubby’s First Ride on Flash! 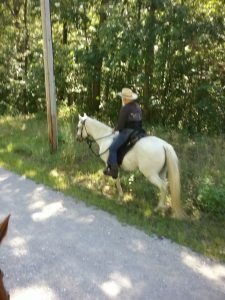 I was thrilled this morning when Hubby said he thought he was strong enough for a ride, so I saddled up BOTH horses, helped him mount his new horse Flash, and off we went! I was so pleased that the horses behaved so well. At first, Flash was hesitant to pass Apollo, he stayed at his flank for the first half mile or so. Eventually, we split to opposite sides of the road, and that seemed to give Flash some freedom, and he started walking a bit faster. Apollo and I had to jog to catch up, but it was GREAT to see Hubby back on a horse at last! He hasn't been able to ride since April of last year, as he's been dealing with a whole variety of health issues, but we're finally settling down to a routine and he's been improving greatly over the last few months. So glad he was strong enough for a ride today!! It was a short ride, just under 3 miles round trip, but it was enough for him and Flash to start to get to know each other. I've been a bit worried, because Flash can be a handful, but he's settled down nicely. He did get a little excited after we trotted a little, and then he wouldn't stand very well, but Hubby didn't have any problem with him. Such a difference from his old mare Clio, who was so slow, steady and bombproof! But he really enjoyed himself, and was so glad to be back in the saddle again, albeit for only an hour. His hips started to ache (likely from lack of use! ), but that should take care of itself as we start to ride more regularly, hopefully. We also had a great day of dialysis in the afternoon, FINALLY finding a great place to start our buttonhole for the arterial port, after several weeks of false starts, half halts and plain old problems. But I finally found it perfectly today, and can't wait to create this buttonhole! That should make the whole process easier, finally, and should become routine before long. After 10 months of trying to nail down his dialysis access, I think the light at the end of the tunnel is getting much brighter, at last!! As soon as we finish making buttonholes, and get his catheter out, we're heading back on the road in our great big new (to us) Trailrider trailer! Can't wait!!! 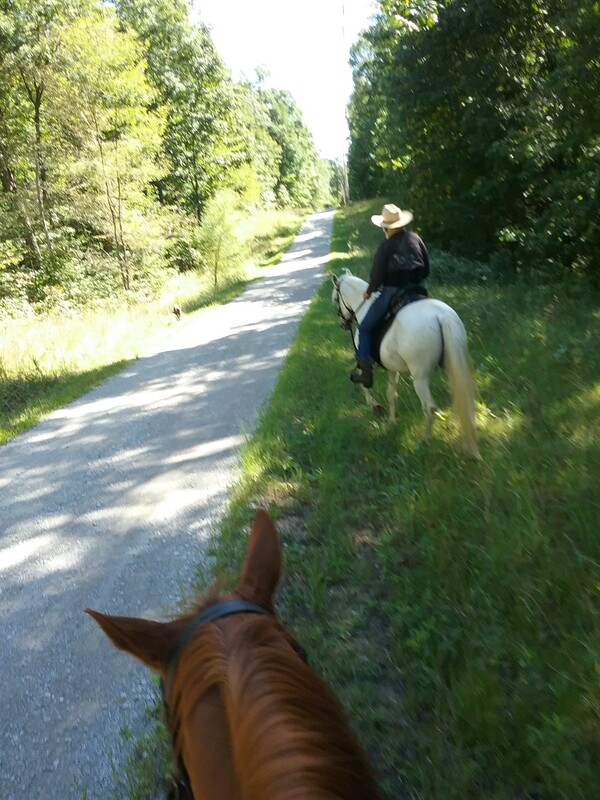 This summer has been such a blur, and because it didn’t really have any travel or horse camping in it, I just stopped doing my Horse Camping diary. So sorry!! But in between trips to Vanderbilt in Nashville to get treatments, surgery, training and doctor’s appointments accomplished, the summer seemed to fly by! I tried to ride our new horse Flash at least once a week, with just a few weeks missed, and he’s been coming along beautifully. When we started, he was so jumpy, and needed constant contact with the bit just to keep him from running away with me. Eventually I got him so calm that now, for the most part, he can be ridden with a nice loose rein, at least until he’s asked to kick it up a notch, in which case he gets a bit hard to settle down afterward, but even that’s greatly improved. I think he’s just about ready for Hubby as soon as he’s strong enough, fingers crossed! Today, though, I thought it was time that I see what kind of condition Apollo is in after his summer off, so I decided to saddled him up and see how he did. Much to my surprise, Flash started whinnying for him as soon as I took him out of the paddock, and Apollo even whinnied back a few times. I was a little surprised, because Apollo still nips at Flash for no apparent reason, and lately I’ve seen Flash kick back in Apollo’s directions a few times, though I can’t say I’ve ever seen him make contact (though I suspect Apollo has done so to him, sorry to say). Anyway, the whinnying got more frenzied as we headed up the driveway, but once Apollo was out of sight and hearing, it settled down a bit, though every few hundred yards, Apollo would whinny again, even when we were miles away! Apollo did great, though his walk was uncharacteristically slow, but we trotted and even cantered, too, a nice controlled canter with no jigging, thank goodness! 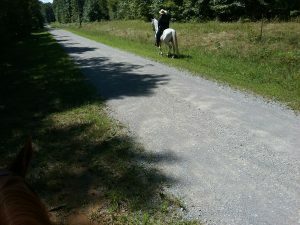 It was a nice two hour ride, and ended with more whinnying when we got within reach. So happy he did so well, and I’m hoping that absence will make the heart grow fonder, and Apollo will be a little less hard on Flash. After a whole summer together, you’d have thought they would have learned to get along better! They stand together a lot, and Apollo really only gets aggressive when there’s food or humans around, the rest of the time they seem to stand nearby each other. I guess the herding instinct trumps their personal feelings! Since he did so well, and I really want to progress the plot here, I suggested to Hubby that if he was feeling strong enough tomorrow, I thought both horses were ready for a ride together. I think Flash would be calmer for Hubby riding on terrain that he’s gotten to know well rather than wait to get into woodland trails he doesn’t know (which always make him jumpy), and I’m hoping that after all the whinnying sessions, these two might behave okay on the trail together (well, road for now.) Hubby said he was up for the idea, if he felt strong enough in the morning. It would be his first ride in 17 months! I hope it works out! !